The Great Coat And Tie Experiment: Brown for Spring? Sure, why not brown for Spring? Today's necktie also has blue and tan dots just to mix it up a bit. There's a paisley-like patterns woven or jacquarded (is that a word?) into the fabric. It's fairly difficult to see and I don't know if the picture shows it all that well. It's a Talbott Best of Class but I think it's a bit older since it knots a little on the smallish side, as knots go. The dress shirt is a pinpoint, tab collar. It has brown, tan, navy and blue stripes. The sport coat is solid brown. Tab collar dress shirts take a bit more planning. 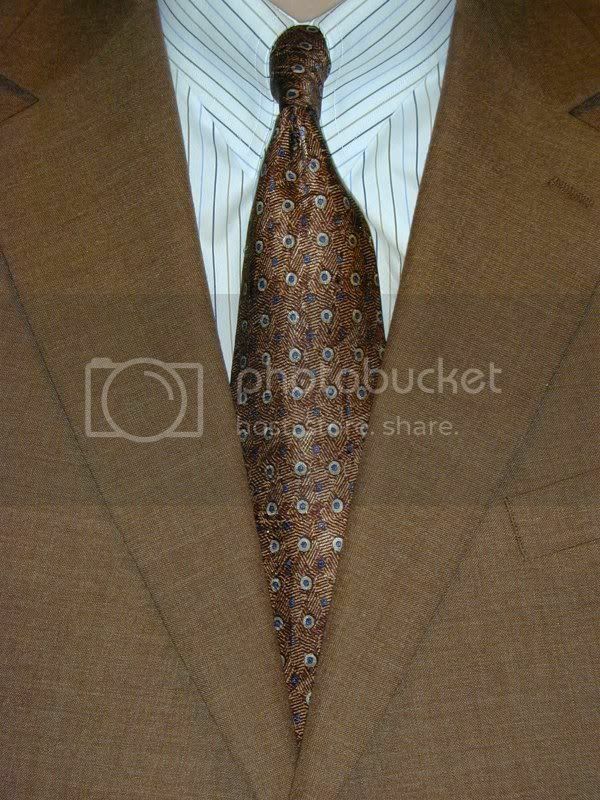 You could wear any tie with them but if the tie makes a big knot, it will be difficult for the tab to contain it all. It will also make it look kind of funny too. A snap tab may give up and unsnap unexpectadly. A button tab is difficult to get fastened when the knot is too big. Today's dress shirt happens to have the button variety and it was difficult even with a smaller knot. I have some ties that I won't wear in Spring and Summer. However, some consider plaid ties to be cold weather wear. On the other hand, I don't own any pastel ties for Easter or bright resort-style ties that some men like for Summer.